Community • Golden rule can apply to even politics and religion. 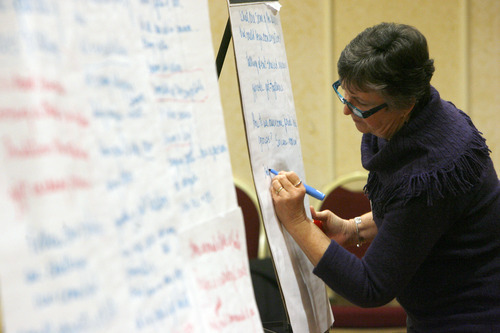 Francisco Kjolseth | The Salt Lake Tribune Jane Holt, coordinator for Utah Civility and Community, creates an "idea harvest" developed from a discussion of "Civic Expression of the Golden Rule" at this year's Interfaith Roundtable at the Marriott hotel in Salt Lake City on Thursday. 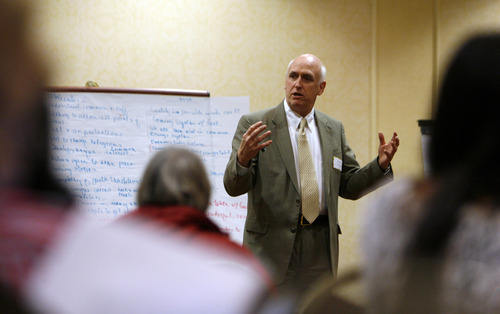 Francisco Kjolseth | The Salt Lake Tribune John Kesler with Utah Civility and Community leads a gathering of interfaith leaders as they discuss "Civic Expression of the Golden Rule" at this year's Interfaith Roundtable at the Marriott hotel in Salt Lake City on Thursday. Discussing religion with practitioners of a different faith may not seem like fertile ground for civil discourse. But members of Salt Lake City's Interfaith Roundtable are doing just that as they celebrate February as Interfaith month in Utah with a range of activities designed to bring together people of different faiths. Leaders kicked off the month-long celebration Thursday with a prayer breakfast and civility training at the West Temple Marriott hotel. Participants discussed how the "golden rule"  treating others as you would like to be treated  can be applied to the most divisive of topics, including politics and religion. "It isn't just about manners," said discussion leader John Kesler, of Utah Civility and Community. "It's about getting a skill set you can use to discuss any topic in a civil manner." Under Kesler's guidance, people from different faiths formed small groups to brainstorm ideas for engaging others from outside their faith community. Each group then shared their ideas  and challenges they could face  in an idea "harvest." Food was a favorite idea, with suggestions ranging from ethnic cooking classes to inviting the community at large to religious services associated with such events as a Passover seder or Lenten dinner. Other ideas included visiting other places of worship, partnering on service projects, and accepting that interfaith situations can be a bit uncomfortable at first. Kesler hopes that by targeting faith leaders, civility will trickle out into congregations and become part of everyday life, influencing everything from family dinner discussions to the 2012 presidential election. Dee Rowland is hoping to bring more civility to the Utah Legislature, where she has lobbied on behalf of the Catholic diocese for more than 20 years. Certain topics seem to make tempers flare and harsh words fly, Rowland noted, with immigration the current favorite for personal attacks. "That's where the tendency to label each other hurts our efforts," Rowland said. "Not just building a community, but maintaining what we have." The growing civility movement is a hopeful sign, Rowland added, because it shows that most people want to improve themselves and be "better human beings." Neighbors tend to be civil to one another, but that isn't enough for Christine Balderas and the Canyon Rim Community Connection. Her goal is to have residents of her Millcreek neighborhood move past pleasantries and truly get to know one another. "Our biggest goal is just to try and get people to throw street parties," Balderas said. "People kind of get into their own groups, and they don't always get to know each other." The Salt Lake City Main Library, 210 E. 400 South, hosts another civility training for religious leaders on Feb. 9 at 6:30 p.m. Email utahcivility@gmail.com to sign up. A complete listing of Interfaith Month events is at http://www.interfaithroundtable.org.